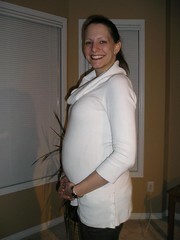 Here is a picture of Shannon taken at the beginning of her 22nd week. She keeps getting larger and more beautiful by the day. We've also been looking at more baby items lately which is exciting since it means the big day is getting closer week by week. We were also at Sears and Toys R Us over the weekend and started putting together a registry. This was a slow process since we still don't really know what we need yet. Posted by Anthony at 3/07/2007 09:33:00 p.m.